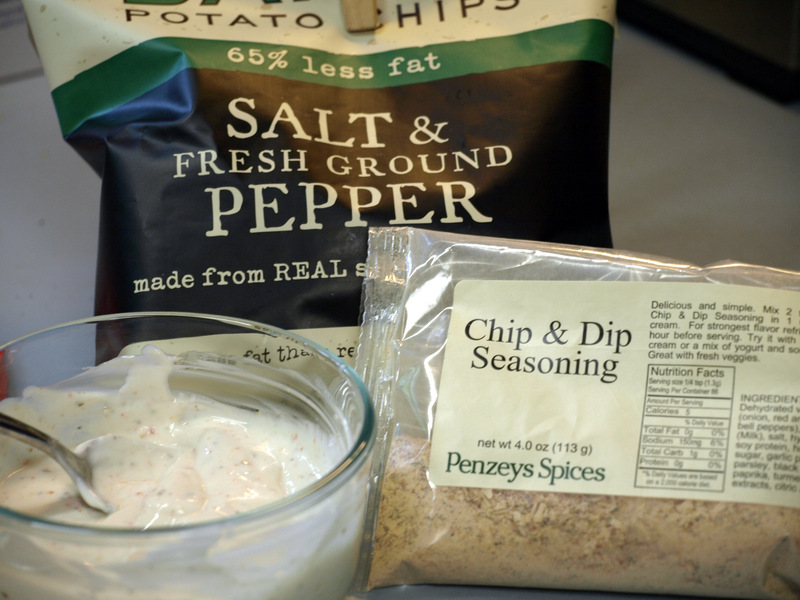 I am defenseless against plain Lay’s potato chips and cheap, trashy, premade onion dip. Salt, fat, and dehydrated onions: why does this palate-killing flavor bomb make me want to eat my weight in junk food? Besides the ridiculous calorie count, the potato chip and sour cream based dip combination delivers way too much fat for my aging gallbladder. Go ahead, eat the whole damn 4-ounce bag of baked Kettle chips, too: it clocks in at 480 calories and 12 grams of fat (600 calories with dip, in case you’re still counting). ETA: I feel compelled to tell you that I ate carrot sticks, cucumber spears, and endive along with the chip-n-dip feast. I love that I now have a Penzey’s down the street from my house. I’m going to have to look for this next time I pop in. Are you using plain greek yogurt? Ooh, a Penzey’s on your street…nice! Yes, I’m using plain greek yogurt, usually Chobani from WalMart. I prefer the greek style yogurts without pectin; I find that the pectin imparts a grainy texture. I also like the Green Goddess and Peppercorn salad dressing dry mixes…you can stir ’em up with as much or as little fat as you’d like. I know this is old and you’ll probably never see it, but I have the same weakness for french onion dip and I placed my Penzeys order just now. I’m also trying the Green Goddess mix. Can’t wait to get my healthier junk food on! Of course I’ll see it–all of the comments appear in my inbox. Glad you can scratch the onion dip itch in a healthy way. Try the yogurt version as a sandwich spread or devilled egg filling. Oh, now you have me thinking is it possible to do a homemade pimento cheese spread using greek yogurt. I may have to do some experimenting this weekend! For sure you can do greek yogurt ‘minna cheese. I would shred the cheese, mix w/pimentos & any other flavorings, and whiz in the food processor until fairly soft before stirring in the yogurt. Greek yogurt thins out and gets a little watery if over-stirred, so you’ll want to mix everything well before adding the yogurt.